Powering Performance. Inspiring Excellence. is the vision of Canadian Sport Institute Pacific, which offers world-class Olympic and Paralympic training environments at campuses in Greater Vancouver, Victoria and Whistler. It is also a metaphor for the empowering leadership and impressive track record of its Chief Executive Officer Wendy Pattenden of Vancouver. Serving as CEO since 1999, Pattenden has brought to life a strategic direction designed to mobilize the sport science, sport medicine, coaching & life services experts delivering leading-edge programs to athletes and coaches to ensure they have every advantage to win medals for Canada. Under her collaborative leadership style, Canadian Sport Institute Pacific has forged dynamic relationships with federal, provincial and local governments and other key stakeholders, partnered with over 20 National Sport Organizations, employed more than 75 specialized experts and attracted high performance athletes from throughout British Columbia and across the country, including more than 45% of the Canadian Olympic team at Rio de Janeiro 2016. Nationally-recognized for the best practices she brings to the business of sport, Pattenden also developed the organizational mantra Collaborate. Serve. Innovate., now the calling card for results at Canadian Sport Institute Pacific. Its team of sport scientists, coaches and support staff helped contribute to over 50% of Canada’s medals at Rio 2016, including a second consecutive bronze medal in women’s soccer, the bronze medal debut of women’s rugby sevens and more. An MBA (Royal Roads University 2004) and adjunct professor at the University of British Columbia (School of Kinesiology in the Faculty of Education), Pattenden is one of the country’s leading advocates for sport, athlete and coaching development. That passion has helped the Canadian Sport Institute Pacific grow to an annual budget of $7.7 million in fiscal 2016, largely on the strength of strategic and government partnerships that have generated funding of $4.7 million this year (up $900,000 or 24% since 2013). After playing an instrumental role in forging a dynamic $3 million naming rights deal with the Canadian Olympic Committee (COC) for the Canadian Olympic and Paralympic Sports Institute Network, Pattenden is resolute in her commitment to building a sustainable funding model for Canadian Sport Institute Pacific in particular and the national network overall. In addition, Pattenden and her team have built a series of programs and athlete services that inspire $3.5 million in annual support from business leaders and the community. Pattenden’s legacy of executive leadership and community philanthropy includes her role as one of the main architects of the PacificSport regional network in 1999, serving as a guiding force behind the Canadian Sport For Life (CSFL) framework — a Federal-Provincial/Territorial framework promoting competency in fundamental motor skills. To this day, Pattenden serves as the Chair of the Board of Directors for the Canadian Sport For Life Society. A former top 100-ranked professional tennis player and 12-time national tennis champion, Pattenden served 13 years as both the Director of Athlete Development and Head National Team and Olympic Coach for Tennis Canada. She led Canada to its best-ever result in the Federation Cup women’s world team tennis championship, finishing among the top four nations in the world in 1988. Pattenden was named Female Athlete of the Year (City of Greater Victoria) in 1978 and was inducted to the Greater Victoria Sports Hall of Fame in 2003. Kirsten has been working as an applied mental performance consultant for fifteen years. She graduated with a Bachelor of Arts in Human Performance from the University of Victoria and then completed a PhD in Sport Psychology at the University of Bristol, England. Kirsten competed for Canada in rowing at the 1988 and 1992 Olympic Games. She is a double Olympic Gold Medallist from the 1992 Games and a World Champion from the 1991 Rowing World Championships in both the 4- and 8+. Kirsten has returned to Vancouver after thirteen years in the UK. In the UK she worked as a sport psychology consultant for national teams such as squash, rugby, triathlon, and badminton, and with several national team individual athletes in sports such as rowing, cart driving, athletics, swimming and three-day eventing. She spent time as a board member of the English Institute of Sport and later worked as the National Lead for Sport Psychology for the Institute. Kirsten brings a wealth of knowledge to the Canadian Sport Institute from her experience as an athlete, academic, and professional. She has a knack for storytelling and borrows from her experiences in rowing to make her interactions with athletes engaging and meaningful. Susan has been providing sport nutrition consulting services to various athletes and teams for twenty years. She is a graduate of the University of Alberta with a Bachelor of Science in Nutrition, and also spent nineteen years working a highly specialized eating disorders program as a Nutrition Counsellor. Susan is a level 1 certified anthropometrist with the International Society for the Advancement of Anthropometry (ISAK) and has completed the International Olympic Committee Sport Nutrition Diploma Program. Over the past eight years Susan has been intimately involved with Canadian high performance sport through her work with national teams in rowing, swimming, rugby and cycling, and individual athletes competing in track, diving and triathlon. Her purpose is to promote sport excellence through leading edge nutrition consultation during training and competition. David is a graduate of the National Coaching Institute BC, holds a Master of Science from the University of Victoria and a Bachelor of Education and a Bachelor of PE from the University of Calgary. He brings over 20 years of coaching experience in alpine skiing and rugby, where he coached from grassroots to national team programs. Beyond his coaching, David spent three years at the Coaching Association of Canada in Ottawa before moving back to Victoria to join the Canadian Sport Institute in 2006. David continues to be a key contributor to the development of the National Coaching Certification Program having played a lead role in the coach evaluation and the development of the new Advanced Coaching Diploma. He has enormous passion for legitimizing the role of coaching in Canada, by increasing the professional status of coaches and advocating for the value of coach education, coaching and athlete development. Sharleen joined Canadian Sport Institute Pacific in a full-time capacity in June 2017. Over a 30+ year athletic and professional career, Kurt has successfully contributed to Canadian and International High Performance Sport as an Olympic athlete, Olympic and National Team coach, and HP Sport Director. A 1992 Olympian, multiple-time Canadian Cycling Champion, and two-time recipient of the Coaches Association of Canada Coaching Excellence award (98 & 99); Kurt has achieved excellence as an Olympic Athlete, and as an Olympic Coach. As a coach, Kurt contributed to the achievement of medal winning performances for multiple athletes at World Championships, Commonwealth Games, Pan-Am Games and Olympic Games events. Kurt is a graduate of the Sport Administration program of Mount Royal University, and the National Coaching Institute-Calgary. A Chartered Professional Coach (ChPC), Kurt earned a diploma in High Performance Coaching and NCCP level 5 certification in Cycling, and NCCP level 4 certification in Speed Skating. Kurt is the Director, Talent Development, with the Canadian Sport Institute Pacific (CSI Pacific). Kurt is responsible for leadership of the Talent Development Business Unit and programs, and is the Technical Lead for the RBC Training Ground program across Canada. In collaboration with CSI Pacific’s Directors of Performance Services, Kurt also manages performance solution relationships with summer National Training Groups (NTGs) and their affiliate NextGen Institute Programs (NGIPs) to facilitate the appropriate utilization of best practice sport science and medicine services to enhance the daily training and competition environments within these sports. Liz has since been working as an exercise physiologist with the Canadian Sport Institute since 2006. 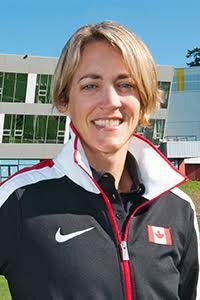 A graduate of the University of New Brunswick with a Bachelor of Science in Kinesiology and a Master of Science in Physiology from the University of Victoria, Liz been a member of the IST for several major games including the Beijing Olympics and Paralympics, the 2010 Commonwealth Games, the London Olympics, many World Championships and other international events. Liz is a valuable contributor to national teams such as swimming, rowing, and wheelchair rugby. Her purpose is to support athletes and coaches through testing and monitoring in the daily training environment and in competition. This involves working with athletes, coaches and the IST to detect and close gaps in performance, prepare for travel, plan for competition in different environments (heat, altitude etc.) and implement interventions to improve performance. A native of New Brunswick, Liz is an outdoor enthusiast who enjoys gardening and cultivating home grown fruits and veggies to make gourmet meals for her friends and family. Mountain biking has been a big part of Liz’s life, but most recently she has been using her bike as a means of towing her daughter around Victoria. Dr. Paddy McCluskey completed a BSc in Human Performance and an MSc in Exercise Physiology at the University of Victoria before completing his degree in Medicine in 2005 (UBC). He did his post-graduate family medicine training Victoria and a 1 year fellowship in Sport and Exercise Medicine in Victoria from, completing his Diploma in Sport Medicine in 2008. He is a member of the College of Physician and Surgeons of BC, the College of Family Practice in Canada, and the Canadian Academy of Sport and Exercise Medicine (CASEM). He has since worked as a physician in Sport and Exercise Medicine physician in Victoria, BC. He is an Affiliate Clinical Instructor in the Island Medical Program at the University of Victoria and is a Clinical Instructor for the Victoria Family Practice Residency Program. His interests include general Sport and Exercise Medicine and injuries related to endurance sports. Currently he works as they Medical Lead for Triathlon Canada and Athletics Canada’s western hub in Victoria. He works with Rowing Canada’s Victoria training centre and has been the medical director of the Victoria Marathon since 2007. Born in Cape Breton, Nova Scotia, Dr. McCluskey moved to Victoria in 1987 to compete for the University of Victoria’s varsity cross country running and track program. He was a three time member of the senior men’s Canadian Cross Country Running Team. Dr. Sheppard worked at Surfing Australia 2011-2016, before which he worked in strength coach and senior scientist positions with Olympians at Queensland Academy of Sport, Australian Institute of Sport, and Canadian Sport Centre, where he was hired by the late Dr. Gord Sleivert as one of the original staff for the Sport Centre. After completing his current work with Surfing Australia, Dr. Sheppard Joined CSI Pacific full-time in spring 2016. In his current role he focuses on providing his physiology and nutrition expertise to Canada’s national rowing, track and field and triathlon teams, as well as leading Canadian Sport Institute’s Innovation and Research division. Trent previously worked as the senior leading scientist in Performance Nutrition for Power Bar at the Nestle Research Center in Lausanne, Switzerland. An experienced researcher, Trent has more than 40 peer-reviewed scientific publications and is currently on the editorial board for the International Journal of Sports Physiology and Performance and International Journal of Sports Nutrition & Exercise Metabolism. He has co-authored six book chapters focusing on the role that nutrition can play in supporting elite athlete performance, including a chapter on ‘Nutrition for the Endurance Athlete’, for the newest version of the 2013 IOC Sports Nutrition Encyclopaedia. His expertise is paired with his ability to deliver complex scientific concepts in an informative and applicable way. He co-supervises a number of master and PhD student collaborative research projects at UBC, UVIC and Guelph. Drew has been employed at Canadian Sport Institute Pacific since 2013 after graduating with a Bachelor’s Degree in Sport Management. In addition to his role at CSI, Drew has volunteered on Team BC’s Mission Staff for both the 2015 Canada Winter Games in Prince George and the 2017 Canada Summer Games in Winnipeg. Noah comes from both a media and management background, specializing in sport. After graduating with a BA in Communications from Concordia University, he worked in television production in Toronto for CBC Sports and Hockey Night in Canada. He then moved to London, England where he worked in both TV production and multimedia with UEFA for soccer (well, football). After his time in England, Noah returned to his home town of Victoria and used his technical and creative skills as a web designer. At the same time, he graduated with a sport-focused MBA from IE University in Madrid. He joined the Canadian Sport Institute shortly after his graduation, in January 2013. Noah looks after all interactive media at the Institute and also acts as chief point of contact for all agreements with our NSO partners. In his free time, Noah volunteers for ConIFA (the Confederation of Independent Football Associations), loves spending time with his kids, still plays soccer (poorly) and travels at every available opportunity.